The Grand final of the Race to Wellingborough managed by the Northamptonshire County Golf Partnership and supported by Titleist/Footjoy took place on Monday 29th October as part of the Wellingborough Junior Open . Over the course of the season 14 golf clubs have hosted a junior open, 110 boys and 23 girls have played in the different events around the counties clubs. After each event the top twenty players were awarded points, the points gained were used to decided who should play in the Grand Final at Wellingborough. The final qualification table used each players best six results, this led to 16 boys and 7 girls fighting it out for the Grand Final. With three prizes at stake in both the scratch and nett competition there would be six prze winners. The weather on the day was very kind, early sunshine and light winds presented a crisp but pleasant day for play. Wellingborough presented the course in excellent condition which after the recent wet weather played very long. This reflected in the scoring but as with all of these events a number of players brought their A game. In the gilrs scartch competition the final results saw Millie Billson - Northamptonshire County win from Raynor Edwards - Whittlebury Park. 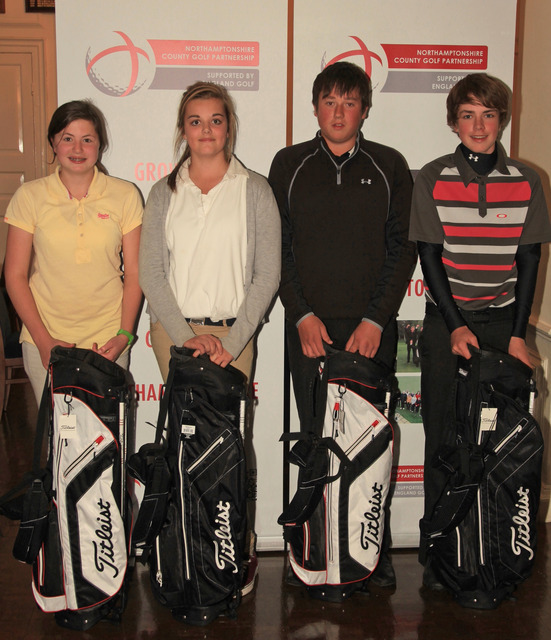 The nett competition saw home player Rebecca Maclaren win from Hattie Billson - Northamptonshire County. It is worthy of note that all the girls who qualified have benefited from being part of the the Academy coaching programme this season. The boys scratch competition was won by county boy player Sam Henfrey of Whittlebury Park with a fine one under par 71, second was club mate Mitchell Edwards on 74 and third was Jack Brown - Brampton Heath on 77. In the nett competition a score of 84 - 13 - 71 by Fergus Robinson - Whittlebury Park secured first place from Aidan Rosling - Collingtree Park 77 - 5 -72, in third place was Artur Koyama - Oundle on 94 - 19 - 75. All the boys who qualified have been part of the county or academy programme over the last few years.